We are one week (mostly!) through the baseball season. In Ottoneu, this specific period of time feels more gut-wrenching than in other fantasy sports formats. I have no facts to support this – maybe it’s the negative points players can score? – other than noting that when multiple -4 scores come in from Russell Martin, or you see Greinke put up a -30 line, it is easy to feel like the most desirable outcome is to lay at the bottom of a large body of water. Ottoneu can be a difficult game, and (especially) if you have any idea of the points thresholds it takes to win, it can feel even more daunting to see your squad trudging along. However, it is important to remember that the season is VERY long, and that every team will have several bad weeks. During this period of the season, it is easy to overreact and make a rash move to counteract a poor start. Everyone wants to own Trevor Story when everything he hits is a home run. Meanwhile, a Michael Pineda owner might be a little more fearful about how this coming season will go after his -14pt start against Houston. In the midst of this, you may start to see some trades in your leagues that could give you pause. Ottoneu has many variables which play into trades that are often ignored in standard fantasy leagues (salaries, loans, dynasty, etc.) so sometimes you can see a deal pass through your league that looks a little strange (even if not on the basis of talent being exchanged). Today I want to highlight some of these trades and also take a little time to echo patience if you are considering selling off – especially if you are in a brand new league, it’s far too early. Let’s look at some interesting trades from the past week! Loans are one of the more unique concepts in Ottoneu. Typically, in trade of this nature a team will cover the difference in salary exchanged. Owen hits the nail on the head. It would be more common for a $36 Puig to be traded with a $31 loan for a $5 Charlie Blackmon, and neither team would gain or lose financially. Both these trades are interesting (not saying either is good or bad) because 1.) They were pulled by the same team at the same time, by the same owner and… 2.) Neither includes a loan. In this scenario, it looks like “Ruff…” is offsetting some the $31 salary gain from parting with Puig with the $9 loss of adding Gray. I like his side of both these trades. Good work! Sometimes a loan isn’t necessary when you can offset the gains and losses with 2 counteracting trades. Another interesting concept of Ottoneu is the ability to trade a player for nothing. You don’t see this type of situation too often (I’d like to see it more), but in many cases it can be mutually beneficial. In this situation, “Assassins” would probably like part with Joe Kelly (and spend this dollar elsewhere without a cap penalty) so “YouOttoNeu…” is taking him off his hands and adding some depth to their pitching. I like this type of trade, but one caution is that if you want to buy a player from another team, it often is not necessary to include a loan in the trade as well. Even though no loan is included, “Assassins” is still gaining one dollar of cap space. In fantasy baseball (Ottoneu is no different) it is very easy to get wrapped up in the hype surrounding a player. Everyone wants to own Corey Seager! I am disappointed not to have a share of him in any of my leagues (yet…) However, with players like this, it is almost better to “force” yourself to trade him because you can often command very good returns on the basis that teams want to own a guy when he breaks out. In short, even with the $15 in salary gains, this is a very good deal for Seager at $30. 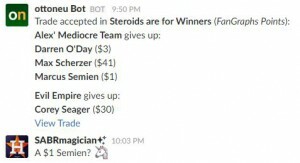 Scherzer is under-priced at $41 and likely to produce more value than Seager on his own, a $1 Semien is a fantastic deal, and a $3 O’day is a very usable bullpen piece. It is very likely that “Steriods” got the best player in the deal in 2016 (Scherzer) along with the asset with the most surplus at seasons end (Semien). The last trade I want to touch on today is one that looks more confusing than it actually is. Given Ottoneu’s cut rules, this is a trade for cap space. In this scenario, “Sir Plus-One” is giving two $1 fliers for the right to cut Pollock and take the $16 cap space that will be associated with this cut. The gain for “Musicians” besides the two $1 fliers is that he can now re-auction Pollock at $17 as soon as he wishes instead of having to wait 30 days if he had made the cut. Maybe “Musicians” doesn’t want a $17 Pollock, but he at least as the option of getting back the player he originally owned at a decent price for next year. Losing Pollock is a hard blow in any league where he is priced fairly. At $33, you can’t just stash him at $10 in hopes of having him back next season. However, you can probably convince a team that the cap space is valuable enough to them that they can cut them for you. If you think your chances in the current season are slim (not saying that’s the case here) it can be helpful to acquire injury riddled talent that may be under-priced heading into 2017. The takeaway is that you can often trade for players with high salaries that you don’t and have a full loan included. Then you can cut the player and have cap space you wouldn’t otherwise be able to acquire. We hoped you liked reading This week in Ottoneu by Joe Douglas! 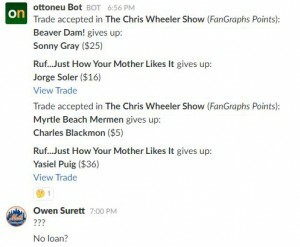 I traded a player for nothing a few years ago (https://ottoneu.fangraphs.com/28/viewtrade?id=1562&pending=1) for exactly the reasons you describe above. My league really didn’t like it. Their argument, which I eventually bought, was that if there’s a market to trade a player for nothing, he would get claimed from waivers and it would have the same effect on your cap. Steering him to a specific owner doesn’t benefit you at all, so it’s strange to do that instead of just dropping the player. We’ve debated that exact point many times on the slack community – whether an owner should just be forced to drop the player instead of dealing him for nothing. I think there are reasons to do so, though. For example, to avoid him being claimed by a league rival you’re competing with for the championship. We all accept the legitimacy of “block” bids late in the season, so I don’t mind this strategy either, as long as a trade isn’t blatantly made in bad faith to give away an excellent player for free. Another point to consider- you are getting a benefit by trading a player for nothing in return, you are guaranteeing that you get the salary relief. Often the types of players being traded for no return are the same ones that sit as free agents for three months after being dropped.